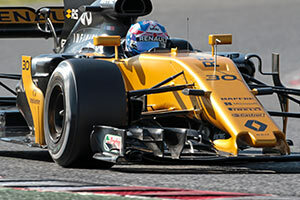 The R.S.17 is the second car following the return of Renault Sport to Formula One. Having suffered throughout 2016 with a chassis that was essentially an adapted 2015 car, the team was working behind the scenes to rebuild its squad, having lost numerous important people in the years before the takeover due to the financial troubles the team found itself in. The 2017 contender however is a much more decent car, with initial driver feedback being positive, and the team declaring it had managed to resolve the largest issues it encountered with the R.S.16. Bob Bell confirmed at the launch: "It’s no secret that our 2016 car was not one born of a lengthy or smooth development process, so the R.S.17 is the first real Renault Formula 1 car of the modern era. It’s a ground-up design as we had the time and the resources to do it, notwithstanding the fact that the change in the regulations demanded it. There is no carryover in of componentry from 2016 to 2017, so it really has been a ‘clean sheet of paper’ approach. "Everything’s new: suspension, bodywork, internal components, the lot. Even the monocoque is different and that’s primarily because of the packaging work we’ve done with Viry. We’ve been able to come up with efficient packaging around the power unit and the cooling systems and we’ve found what we think is a nice solution." The RS17 is a major step forward compared to the team's 2016 car, which was essentially the same as the Lotus car from 2015. Despite these changes, the car's chassis appears to have retained its basic aerodynamic shape as the team focused to iron out the flexibility issues and allowing more space for the front suspension elements. The latter now has a large vanity panel alike what Mercedes did in 2016, allowing for more freedom to fit suspension elements. The latter already triggered a row over the winter as teams started to experiment with hydraulic dampers to simulate parts of the banned FRIC suspension system. The aerodynamic changes at the front of the car consist of a modified nose cone and the integration of an S-duct. The nose continues to feature a thumb style nose, but it was redesigned to improve the interaction with the front wing's neutral middle section. In the end, this should help frontal downforce while also allowing slightly better airflow underneath the chassis and onto the splitter. An S-duct was also added, just like with most other teams in 2017. This catches airflow from underneath the nose and feeds it through an internal duct - in the shape of an 'S' - to the top of the chassis to help keep the flow attached on the upper surface. The sharp kink in the nose would otherwise cause flow to detach and become turbulent. 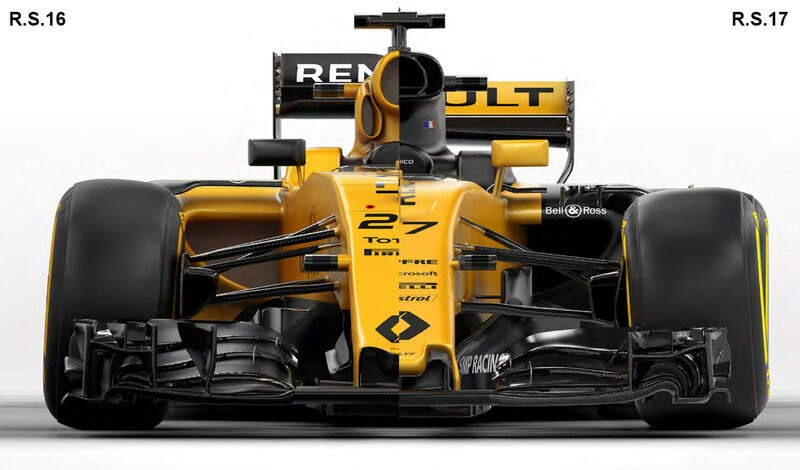 Further back, Renault also opted to change the airbox, removing the 4 seperated ducts into a new, larger airbox that is internally split into 4 sections. Development throughout the season focused mainly on wing design, as well as the barge board area, where a lot more scope was allowed in the 2017 regulations. This area is crucial to effectively dispose the Y250 vortex around the car, and plays a major role in rear end downforce generation. Pre-season testing ranked the car firmly among the midfield, with management also saying to be happy with their largely redesigned power unit. Still, that redesign did cause a few niggles and caused several outages and necessary power unit changes during the course of pre-season testing. The same was the case for customer teams Red Bull Racing and Toro Rosso, but Renault was adamant at the test they would be able to resolve the issues in time for the season opener. Once the season got off, reliabilty was indeed largely resolved, even though it required Renault to detune some items, and revert the MGU-H and MGU-K to an older specification.